FROM nine to ten p.m. (my housekeeper is now back) we watch the hour-long Jeremy Clarkson documentary “PQ17: An Arctic Convoy Disaster” on BBC2. A reader has alerted me to it. Directed by Richard Pearson, it’s being repeated on Monday. Clarkson of course makes himself the central figure; whereas the real heroes were guys like, well, my father who was in HMS Edinburgh when she was sunk not far away a few weeks earlier. Seemingly no expense has been spared – the BBC evidently hired a trawler to take him into the Arctic ice pack, and on to Archangel, and then shot scenes with him in the Kremlin and on the beach of Novaya Zem’lya. ON OTHER things, they skimped: For example any obligation to pay anything to the author of the one and only formal history of The Destruction of Convoy PQ.17. I am glad to see on the Internet readers drawing attention to this work. At least half of Clarkson’s script and storyline is anonymously quarried from my book (published by Cassell & Co.), which was a bestseller in 1967 in Britain and the USA, and which I have good reason to know is in the BBC Library; and much is lifted from it direct, from the quotes at the beginning from the Douglas Fairbanks diary to the death toll among the Allied seamen at the end, which I painstakingly compiled from the British and American ships’ records, without the feet-up-and-take-it-easy use of hired researchers. The BBC has paid me not a penny for the use of my book, nor is there any credit given, but the script is sprinkled with sentences and passages lifted from my work. I was in my twenties at the time, financially struggling to raise the first of five daughters. The research I did was knuckle-breaking. Because the Admiralty refused to provide a photocopy, I had to trace and copy the secret U-Boat code-chart of the northern hemisphere by hand, a job that took many days. Without it, the U-Boat signals were meaningless. To locate the surviving British merchant seamen in the 1960s I purchased large-format Photostat copies of the ships’ Articles from the Registrar General of Shipping & Seamen in Cardiff, which listed their full names and wartime addresses, then trawled through every British telephone directory looking for each of the hundreds of names, and built on those that I found to locate others. That was how we did things in those pre-Google days. I recorded many of the interviews with the survivors and German submarine and bomber crews. (The audio tapes are now lost with all my archives and possessions seized by the authorities in 2002). The documentary pursues particularly the stories of the barrister turned minesweeper-captain Leo Gradwell, Vice-Admiral Norman Denning, Douglas Fairbanks Jr., and others long dead, all of whom I visited and interviewed in depth to build my research. I visited Fairbanks at his home in The Boltons, in Kensington, and he gave me his diary for my book – and here it is, quoted in Clarkson’s movie from that same book, my book, which book is not however mentioned; the same happens with the diary of Needham Forth! Would Mr Clarkson have even known that Forth and his tragic diary existed without my book? The facts from my exclusive interviews with the admirals present at the crucial Admiralty board meeting in July 1942 are also quoted, like the remark by one to me that somebody murmured that the “Old Man” (Admiral Sir Dudley Pound) had fallen asleep; all are long dead, all quoted from my book. Captain Jack Broome is mentioned only briefly at the end. Still alive evidently are Admiral Sir William O’Brien (whom I remember giving evidence against me in the 1970 Broome libel action), in 1942 a junior officer, and a very spry Needham Forth, the Hartlebury radio officer, which really surprises me: he must be in his nineties now. There were only four survivors in his fifty-man crew. I remember travelling to, I think, Gravesend to interview him in the early 1960s. His tattered, sea-salt stained diary is shown on the screen – I last held it in my hands in 1963, fifty years ago. The programme cheaply, and safely, heaps sole blame for the naval disaster on Admiral Pound, the First Sea Lord. But suppose Hitler’s mighty battleship Tirpitz had been at sea? Her fifteen-inch guns would have wrought carnage among the slow-moving merchantmen – “waddling” was the word used by Fairbanks in his diary – if Pound had not ordered the convoy to scatter, as he did. In the prevailing Intelligence fog of the day, it was a cogent decision. 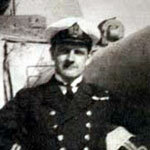 The actual Intelligence error, based on ambiguous ULTRA decrypts, was evidently made in the Submarine Tracking Room, – or so Admiral Denning hinted to me – run by Commander Sir Rodger Winn, later Mr Justice Winn (and brother of the ineffable Godfrey, for those of us older enough to recall that fine, um, journalist: he accidentally sailed from Iceland with the convoy, and I interviewed him too). Identifying that error and its father may well have led ineluctably to the malicious chain of legal events which has befallen me since: That being how the British ruling class has often operated. Well, I’m still standing. And I challenge Jeremy Clarkson and his team to deny that they used my book, and without permission. Just like the German film company who last year based their television spectacular on my Rommel biography, boasted about it to the press, then denied it in court. See ya! I just thought I’d let you know that I wrote a complaint through the BBC website this morning which I’ve copied below. I will let you know their response. 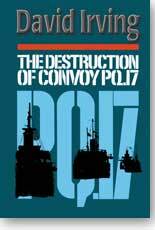 I loved The Destruction of Convoy PQ17, and when I first read it I couldn’t put it down. I bought a second copy for my father who served on Royal Navy destroyers in the 50s/60s and he loved it too. "I watched your documentary on the plight of convoy PQ17 entitled PQ17: an Arctic Convoy Disaster with great anticipation as the subject greatly interests me. 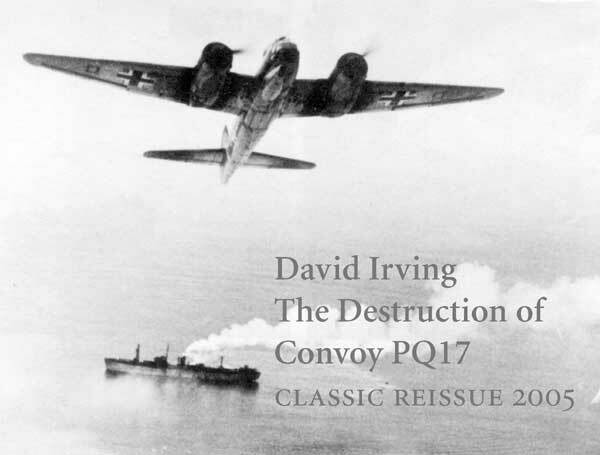 I had open in front of me my first edition copy of David Irving's book the Destruction of Convoy PQ17 from 1967 and was aware almost instantly that the bulk of the detail used in the documentary was lifted directly from the pages within. Some passages and details were quoted almost word for word. Because of this, you can imagine my surprise when, upon reaching the end credits of the documentary, there was not one mention of the author David Irving or his well known book on the subject. This is not the sort of conduct that I would expect to see from the BBC. Shameful."